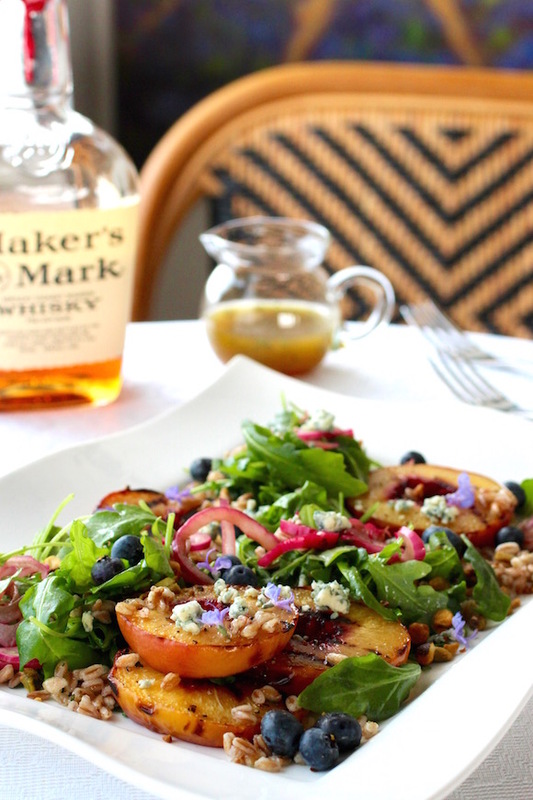 The kinship between peaches and bourbon is the foundation for this wildly flavorful summer salad. The natural flavor attractions and diverse tastes and mouthfeel of pickled red onion, bleu cheese, and pistachio nuts pull it all together like a molecular bond. 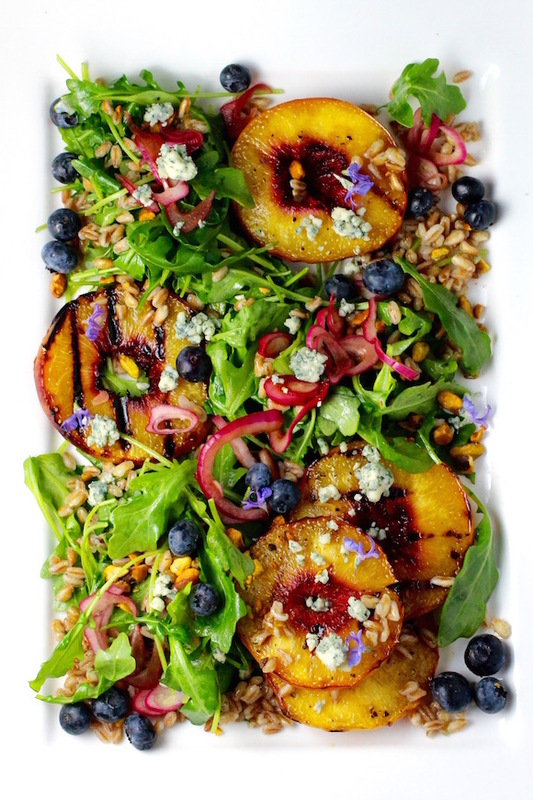 Blueberries add a fresh sunny pop while farro adds a chewy texture and nutty earthy notes. 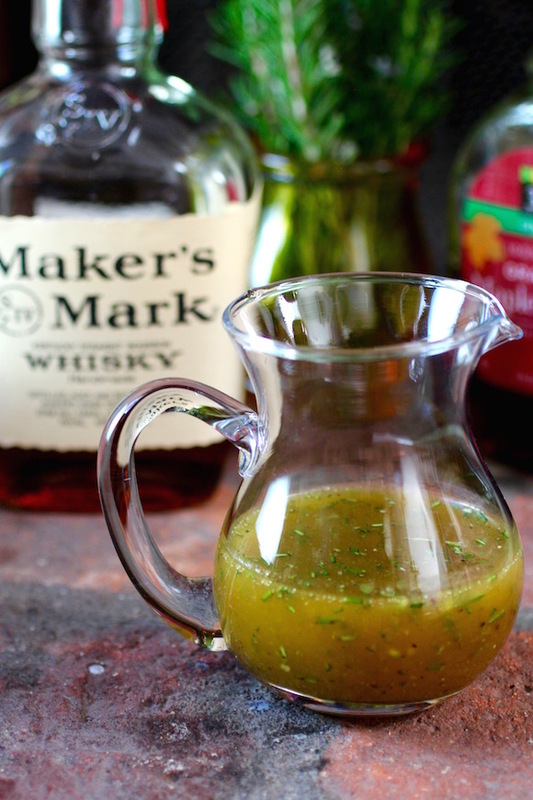 It is all harmonized by the dressing, an over-the top sweet & savory maple-bourbon-rosemary blend that will have the adults swooning. Cook farro, drain, let come to room temperature. Thinly slice red onion, place in a bowl, sprinkle with raspberry vinegar and a little sugar. Let sit until ready to compose salad, then drain. Slice peaches into thick wheels. Toss with a splash each of olive oil and bourbon. Season with salt and pepper. Grill over high heat until grill marks form, turning once. 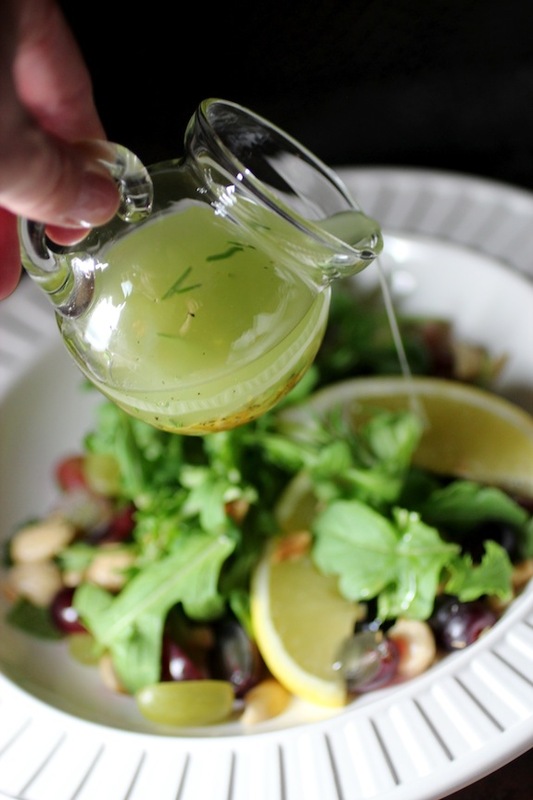 Process the first five ingredients in the small bowl of a food processor, then stream in the oil olive. Season to taste with salt and pepper. Blend again. Serve at room temperature. Toss arugula and farro with dressing. 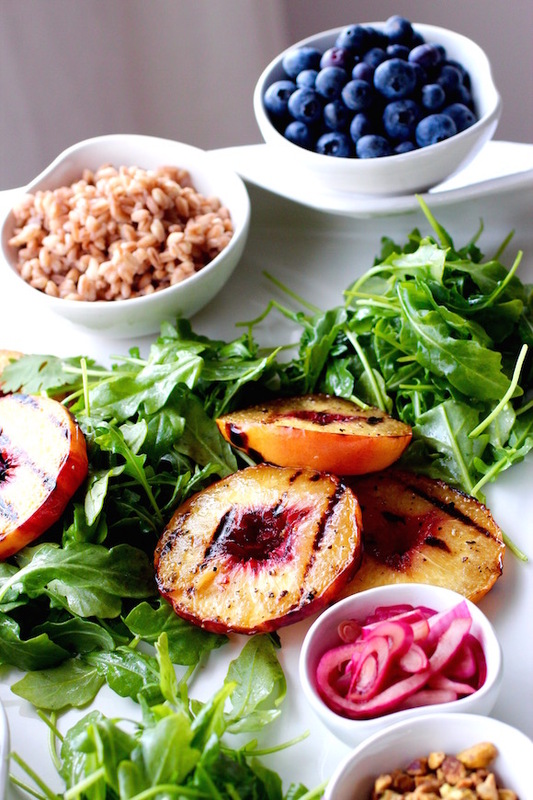 Arrange arugula mixture on a platter with grilled peaches. Add red onion and blueberries. Top with crumbled bleu cheese and rough chopped pistachios. #SummerSoiree is a season long franchise where Food Network editors team up with bloggers to share recipes about everyone’s favorite summer dishes. You might enjoy taking a peek at other peachy recipes from some fabulous bloggers below… and be sure to follow our very popular Pinterest Board with over 300,000 followers called Let’s Pull Up A Chair! That has to be the prettiest salad I have ever seen. 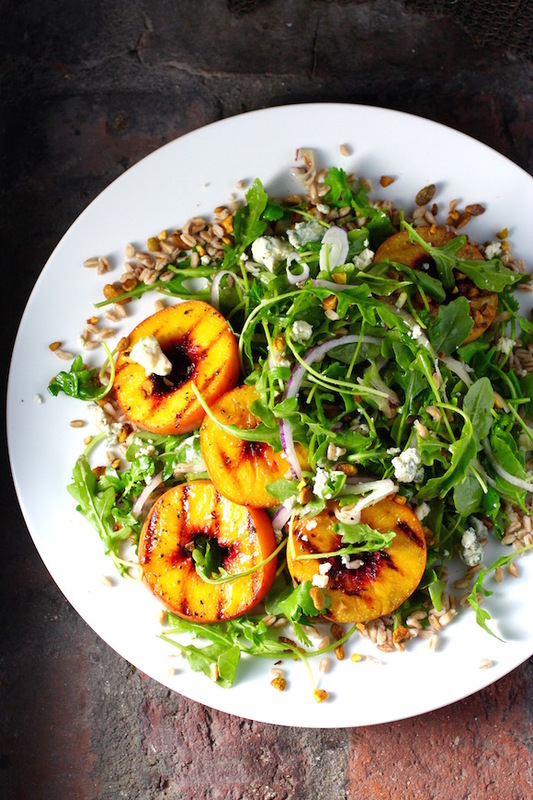 I love the combination of peaches and arugula – sweet with the peppery bite of the greens. Hi Liz – thank you…the combination of flavors definitely worked…the colors were a serendipity. And I would love to have your fruit-baked-oatmeal for breakfast, sounds delicious! What a beautiful salad! Your photos are fantastic. Love the recipe too! Pinning! Hi Lauren – thank you. This salad was a big hit. I love the colors too. Thanks for pinning! 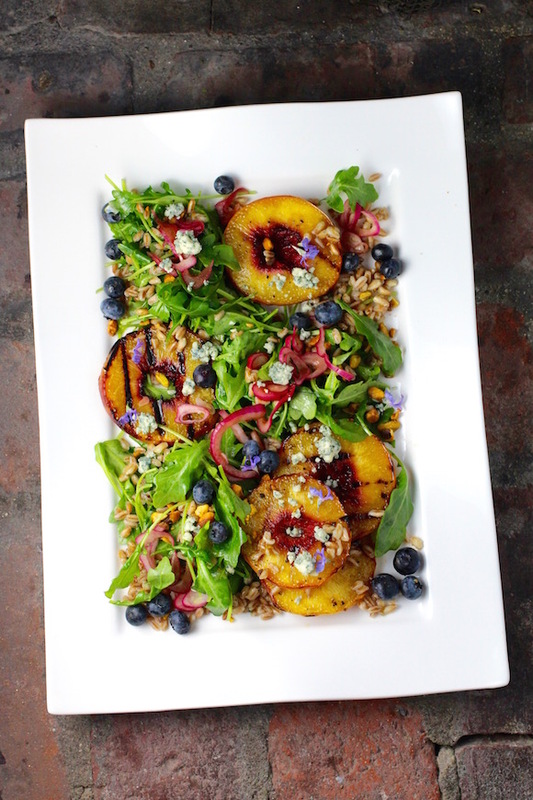 I am so into fruit and grain salads right now – I’ve done farro with apricots and bulgur with grapes and almonds. 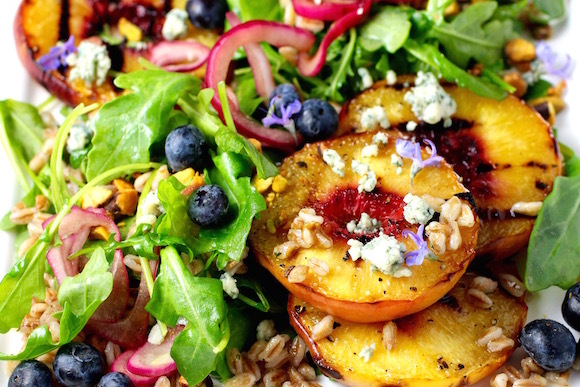 This gorgeous peach salad is next – now that I’ve finally found some peaches that aren’t mealy! 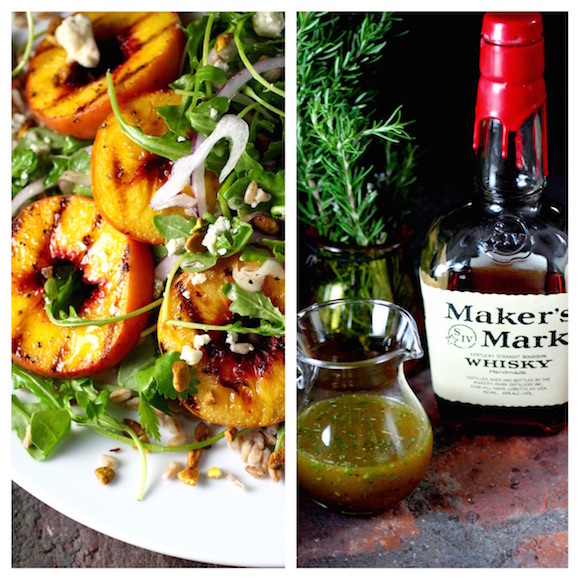 Love the bourbon dressing – thanks for the inspiration, LL! Hi Priscilla – How are you? Yeah, fruit and grain salads rock! Your combinations sound terrific. I’ve been meaning to make one with freekah (soon). Please try the maple bourbon dressing, we loved it here. Made this fabulous salad for dinner tonight! Great flavors, easy prep, gorgeous colors, one of my new favorites. Fantastic recipe, thanks for sharing.